Now that Spotify and Apple Music have reached 30 million song collection, it seems that it's them who are the leaders of online music streaming. They wish. It's a VIDEO. It may sometimes take some time to buffer. Solution: Choose 240p quality. The music is going to remain the same. You can't have only the audio. Turning Youtube videos into MP3 implies using third-party tools. It's no good because Youtube videos don't have CUE components that create playlists. So a full album's going to be a single track. However, there's an option that makes it easy to listen to Youtube video like MP3s, with no downloads or conversions. If you google "how to turn a youtube video into mp3' you will most likeдн find hundreds of similar websites offering you to convert a video to MP3 and then download it. There's an easier and more convenient alternative. VOX is an audio player for Mac & iPhone which has lots of features that will make any audiophile jump for joy. One of them is a Youtube streamer. Now, you must've heard of lots of iOS apps that do this trick, but I can assure you that Youtube streaming without a video on mobiles is against Youtube's Terms & Conditions. Using those uncertified apps is illegal. How to turn Youtube Video into MP3 in? Well, first of all, you have to download the player itself. A few words about it. VOX is a Hi-Res audio player that plays most lossy and lossless audio files, includes some sound-boosting tools (EQ, BS2B, Stereo for Headphones, etc.) and can integrate with Spotify and SoundCloud. Read Lossy﻿ vs. Lossless: What's the difference, if any? When you have the player go to Youtube and find a video you want to listen to, not watch. Copy its link. In VOX, press cmd+U and a window will appear. Paste the link and press Return. Done. The video will appear on your playlist. Even more, you can copy and paste one video from a long Youtube playlist to get all the MP3s in VOX. That's it; you don't need to download or convert anything. One more key thing – if you have VOX for iPhone, you can also listen to the added from Youtube songs on iPhone, but you can't turn Youtube video into MP3 on iPhone. As you know, unlike lossy MP3, lossless files are much bigger – up to 100 MB per song. It makes them difficult to store on Mac, not to say about iPhone. For this exact reason, VOX has its own music cloud storage for all your favorite Hi-Res music. 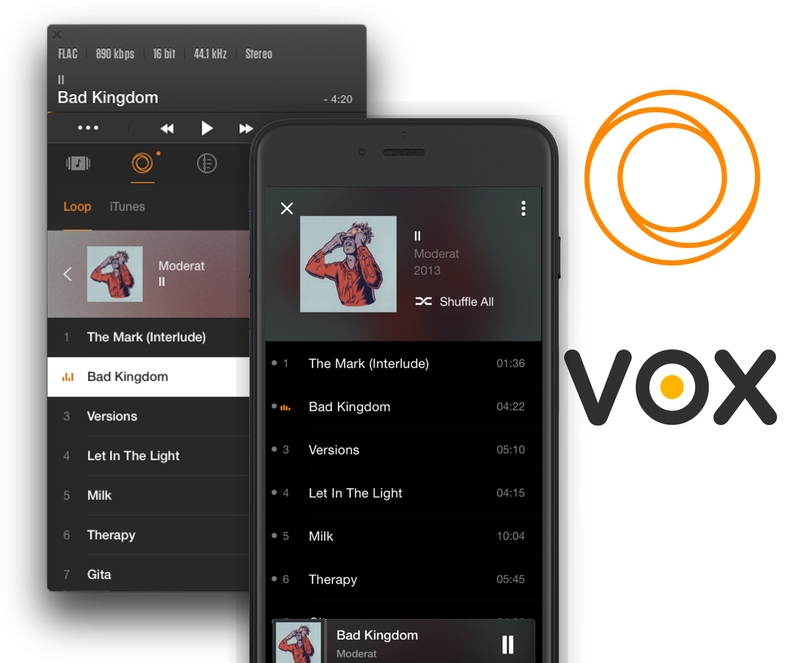 VOX Cloud (formerly LOOP Unlimited Music Cloud Storage) is an unlimited online music storage that works as a music cloud from which you can stream you Hi-Res music. Unlike other music lockers like iTunes Match or Amazon Music, VOX Cloud has no restrictions on formats or sizes. You see I have a FLAC song at 192 kHz / 24 bit (which is 5437 kbps in bitrate!!!). I bet you've never heard that clean sound. What makes VOX Cloud so special is that your Mac and iPhone synchronize. So whatever you upload to VOX Cloud on Mac or via The Web is available on your iPhone. This makes VOX one of few iOS music apps that let you listen to Hi-Res music. Unfortunately, VOX for iPhone can't turn Youtube video into MP3. Stop wasting your time on uncertified tools to convert Youtube videos to MP3 and then to download them and only after that to listen to some music. 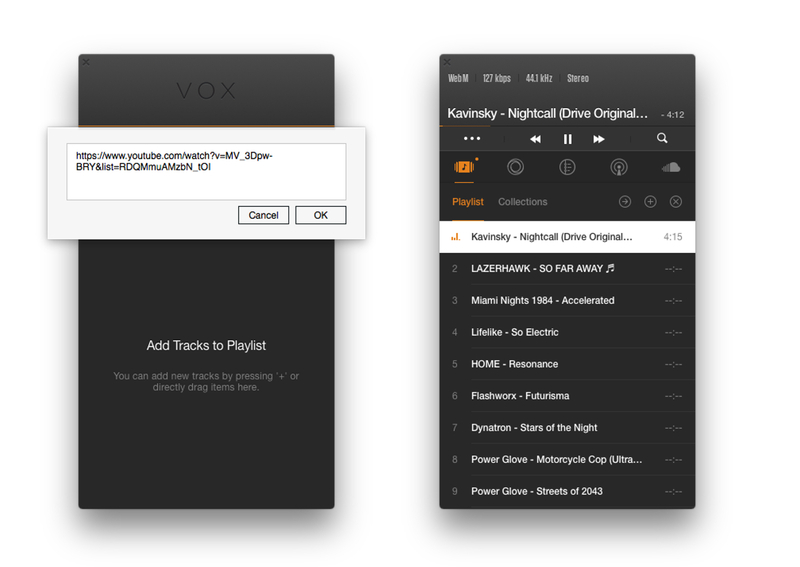 There's an easier way, and that is to use VOX Music Player for Mac. 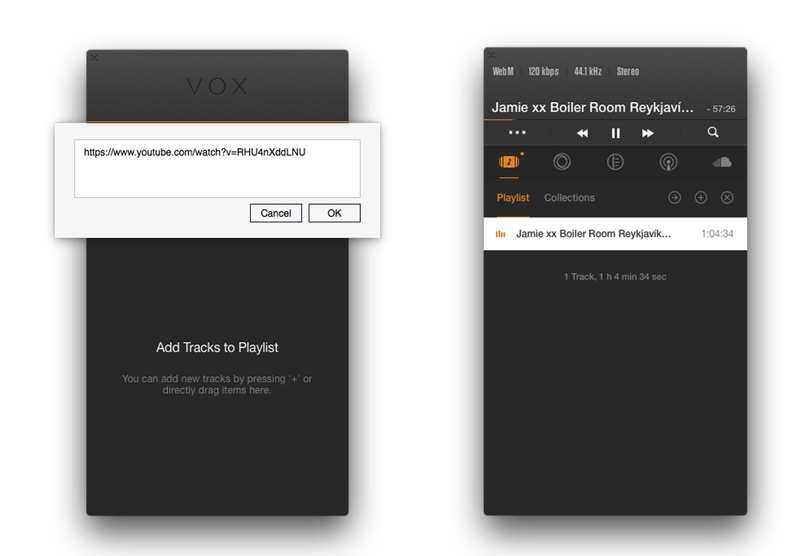 If you use VOX, listening to Youtube audio tracks is easy and convenient. Moreover, with VIX Music Cloud you can have the same Hi-Res collection on your iPhone.